Real Estate Empire 2 contains over thirty different levels packed into four different scenarios. 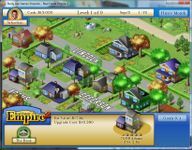 Real Estate Empire 2 features a streamlined upgrade and renovation system that makes the game easier to pick up and play. Real Estate Empire 2 also features a new goals based system that has players leveling up through a variety of different scenarios and goals. The much requested feature of renting has been added - do you wait for good renters who won't damage your newly renovated bungalow or do you get somebody in there to start paying the mortgage today? Real E$tate Empire 2's user friendly difficulty system allows players of all ages and capabilities to enjoy the game. Players will be entertained for hours while learning about real estate management at the same time!